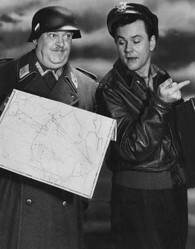 Hogan's Heroes Episode Review: "The Most Escape-Proof Camp I've Ever Escaped From"
A review of the season 2 Hogan's Heroes episode that first aired in 1967. Synopsis: Stalag 13’s no-escape reputation and Col. Klink’s (Werner Klemperer) career are put on the line when an escape artist is captured and housed at the prison camp. Despite Hogan’s (Bob Crane) objections, the prisoner seems determined to follow through with yet another escape because he believes it will help his show business career and make him famous. Guest stars include Edward Knight, Mickey Manners and Bard Stevens. I watch reruns of this show relatively religiously (usually while I’m waiting for my daughters to get ready for bed) and, on occasion, do come across an episode I haven’t seen before. That was the case when I was home for lunch today and happened to come across this episode. This episode was actually surprisingly interesting when compared to other episodes because it was a pretty unique situation for Hogan and his crew. One of the biggest ongoing jokes from this series is the fact there has never been a successful escape but the only reason for that is the prisoners (actually on a secret sabotage mission) don’t try to. So, having a prisoner (Manners) that makes a living by escaping definitely was an enjoyable twist. After all, he’s the type of guy you really don’t want to leave locked away in a prison camp. But, at the same time, if he escapes, everything they worked for falls apart. The most enjoyable part about this plot, I think, was the fact it wasn’t as predictable as other episodes from this series. This is especially true when he decides to go against Hogan’s orders and escapes anyway, leading to some uncertainty about Klink’s future at the camp and putting Hogan in a position where he has to try to complete a mission while the Gestapo is searching for the escapee. The way things manage to fall together at the end was somewhat clever, especially when it looked like the escaped prisoner was going to be punished severely. Needless to say, I was paying attention to this one from start to finish just so I could see what was going to happen next. Some of the episodes from this series are repetitive and somewhat dull as a result. This one, however, was pleasantly unique and had a plot that wasn’t as predictable as someone might suspect it to be. If you’re going to watch an episode of this show, this is one I would definitely recommend watching as a result. Star Trek the Next Generation Episode Review: "Relics"
A review of the season 4 episode that first aired in October of 1992. A review of the season 8 finale that first aired November 7, 2014.